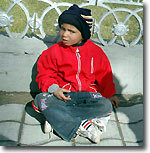 How many homeless children roam Tajikistan is something nobody can tell. This country lacks the system of keeping tabs on the homeless. Homeless children numbered 8,000 or so in 1998 but they are much fewer nowadays. It does not, however, mean that the Tajik state and society experience fewer problems with homelessness or crime, the factors that actually jeopardize the health and prosperity of the nation. It is common knowledge that illness should be prevented rather than cured. Before doing something about juvenile drifters, the Tajik state should address the problems that result in homelessness and that is going to be extremely difficult. No country has completely eradicated homelessness so far. This phenomenon is undoubtedly fomented by economic backwardness of Tajikistan and low living standards. (Unofficial estimates show that over 70% live below the subsistence minimum.) Parental neglect, lack of care and attention at home, and wanderlust - all of that may compel a juvenile to hit the road. As a matter of fact, some of the youngsters that end up roaming the country come from quite prosperous families. Lack of understanding and alienation frequently result in a situation where a teenager feels as much at home on the streets as he does when with the family. Juvenile crime accompanies homelessness, of course. The Interior Ministry reported 619 crimes committed by juveniles in 2007 (11 more than in 2006). Juvenile crime poses a particularly serious problem in the Sogdi region, Gorno-Badakhshan autonomous region, and some other areas like the Gissar district (sixteen crimes committed by juveniles). The state of affairs in the capital of Tajikistan and in the Khatlon region, on the other hand, seems to be improving. Teenagers committed 128 crimes in Dushanbe last year (80 crimes less than the year before). Two hundred and fifty-eight teenagers fell victim of crimes in Tajikistan in 2007 (almost 60 more than in 2006). All in all, young men (juveniles and those who came of age) committed over 3,000 crimes in Tajikistan last year or 204 crimes more than the year before. The number of rapes, murders, muggings, and other crimes of this sort went down. Thefts were particularly frequent. Tokhir Nurov, Chief of the Juvenile Crime Department of the Dushanbe Police Force, said the number of the homeless and criminals among his charges had gone noticeably down. "We keep juvenile drifters in the focus of attention. Most of them have homes and families, by the way, but they found themselves on the streets all the same. Their ages vary between 6 and 18," Nurov said. "We talk to them and their families. Special conversations are arranged with students and others where they are explained their rights and importance of cooperation with law enforcement agencies." According to Nurov, juvenile drifters are mostly beggars. They are to be encountered in any district of the capital of Tajikistan. Many of them are forced to beg by their parents who wouldn't seek a job. Lots of beggars are Gypsies. Very many little beggars are bona fide actors, hunkering in the streets in picturesque rags to inspire pity in pedestrians. According to Nurov, practically no juvenile drifters are winos or drug-addicts. The officer attributes it to local traditions that put up with no intoxication. Law enforcement agencies and officials from the Labor and Social Protection Ministry ran almost 700 operations in 2007 code-named Navras (Teenager), Drifter, Beggar, and Order. A great deal of homeless children were detained. Interviewed at length, juvenile drifters are returned to their families or, sometimes, sent to special juvenile detention centers (mostly for non-locals). Juvenile detention centers staff include psychologists, pedagogues, and doctors. According to Nurov, conditions there are to be envied. Children sleep on clean linen, they are well-fed, and they are cared for by specialists who are also supposed to meet the drifter's family and try to restore the child's relations with them again. Adoption of the law "On domestic violence" currently discussed in the media is supposed to make specialists' task somewhat easier. Endorsement of the legislation by the lower house of the parliament will improve the situation greatly. "First and foremost, we need special centers for juveniles where they will live pending paperwork completion and return to the family," Nurov said. "These centers should employ policemen, lawyers, human rights activists, doctors, and teachers. It will be nice as well if juveniles are taught some vocation there and the use of computers. Gyms won't hurt, either." "Sure, organization of these centers requires substantial funding, availability of premises, and staff. The Tajik Interior Ministry lacks the money, unfortunately. All sorts of non-governmental organizations may come in handy here. We count on sponsors as well. I'm convinced that centers like that will have a thoroughly positive effect on the situation with homelessness and juvenile crime," Nurov concluded.